By 1956 the mines were closed and Morley sat empty. For liability reasons CF&I decided that the buildings of Morley had to be demolished, some buildings were moved, others scrapped. When it was time for the church to come down, work began….and stopped. The men charged with the demolition couldn’t finish the job. Superstition? Or the memories of weddings, baptisims and funerals? No matter, the ghosts of Morley still have their church. This photograph is in infrared, our new hobby. To read more, visit our blog. This entry was posted on Saturday, February 20th, 2016 at 2:41 am. 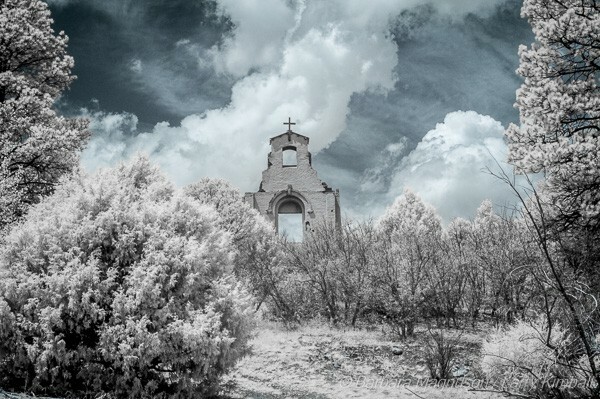 It is filed under Infrared, Stories and tagged with churches, ghost towns, History, infrared, infrared photography, Landscape Photography, Morley Colorado, St Aloysius Church, travel. You can follow any responses to this entry through the RSS 2.0 feed.